Health devices plan to combat Anti-Microbial Resistance. The Ministry of Health and Medical Services has begun consultations with stakeholders to formulate strategies to combat the emergence of Antimicrobial Resistance (AMR). Antimicrobial resistance is the ability of microbes to grow in the presence of a chemical (drug) that would normally kill them or limit their growth. Antimicrobial resistance makes it harder to eliminate infections from the body as existing drugs become less effective. The Acting Permanent Secretary for Health and Medical Services Dr Meciusela Tuicakau opened a two day National Anti-Microbial Resistance Workshop at Warwick Hotel where stakeholders have gathered to develop a comprehensive multi-sectoral national action plan on AMR. The workshop looked at ways to strengthen laboratory capacity, surveillance and resources to manage AMR. Meanwhile the Global Action Plan on AMR was endorsed at the 68th World Health Assembly where the member states were urged to develop national action plans by May 2017. 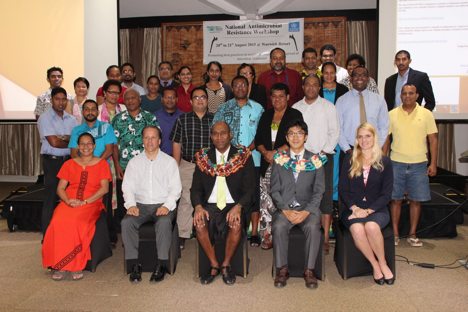 In response, Fiji has proposed establishing a national committee on AMR this year. Previous PostCWMH receives new Trauma EquipmentNext PostNew guidelines launched to address heart disease and stroke.